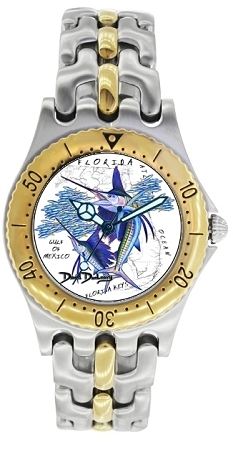 Marlin in color on a map of Florida on a stainless steel watch with rich gold tone accents. Features of this watch include: Stainless Steel Case, 3 ATM Water Resistant, Japanese Movement Technology, Stainless Steel Band, Scratch Resistant, Luminated Hands, Silver Embossed Dial. Officially Licensed David Dunleavy Watches at Nautical Shops. Unprecedented eloquence in style and performance. Craftmanship in abundance. The dial can be described as a functional work of art. Please allow for at least one week processing time.